The JLA find themselves under attack in their own head quarters by an unseen unknown force of evil. He makes quick work of Flash, Superman, Wonder Woman and Faith. He practically eviscerates Jon Stewart and tears the place apart before Manitou uses a magic spell to give Superman the power of sight to see his attacker. 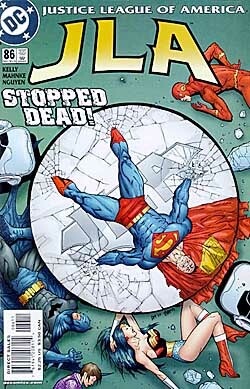 Suddenly a meteor, controlled by Major Disaster, slams into the Watch Tower and the JLA escape. Back in the Fortress of Solitude as the JLA recover, Vandal Savage tells the tale of how he first encountered a Martian. Thousands of years ago he lead his tribe across the arctic and did battle with a wounded version of the beast they face today. It killed his whole tribe before he took it down. Across the galaxy the Guardians of Oa repair the wounds done to Jon Stewart. With a heavy heart they interfere in the laws of fate because of a mysterious guilt that compels them. Later in the Watch Tower Superman speaks up and says what everyone's been thinking. J'onn J'onzz is in fact the mysterious Martian they face now. Flash resists, surely this is the work of a body or brain snatcher. But all that doesn't matter right now. Before they can figure out what happened to J'onn he needs to be stopped. Story - 3: I can't really tell what's turning me off this story. There's nothing specifically wrong with it. I just find myself a little "been there done that" in regard to the whole thing. Plus the introduction of the white Martians and their horrible demise has very little effect on anyone who hasn't read previous encounters with them. So in effect their deaths are meaningless to new readers. I'm also not sure how Jon Stewart got to Oa without anyone in the JLA being concerned about him. On the good side I am curious about all the connecting threads that are inching closer together. By this point in the story there are enough of the pieces to chew on. Art - 4: Mahnke's action sequences are so cinematic and flow so well that I could read them over and over. Plus he has a few really good splash pages this issue that are just fantastic. Cover Art - 4: I enjoyed this cover very much. It almost acts as a "last time in JLA..." recap.